Hungry Jerks - Food Recipes and Restaurant Reviews: Who Has the Best Fast Food Value Menu? Who Has the Best Fast Food Value Menu? We've all been there. Money is tight, no food in the house, so the only quick option is hitting the closest value menu (or dollar menu depending on the place) and loading up. Almost every fast food restaurant has some sort of value menu, but there are many factors like variety and actual cost that can put some places above the rest. I figured it was time to take a look at some of the top value menus out there. 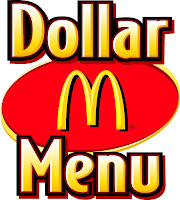 McDonald's Dollar Menu is the first one that comes to mind. They have a small selection, but a good value for your buck. The McDouble is a decent sized burger with two pieces of meat so that is probably the standout item. Aside from that, they have the McChicken which is the only other sandwich on the menu (as you may recall, the 2 sandwiches on the McDonalds dollar menu also comprise the "McGangBang." Another big thing is that ANY size drink is a dollar, so that's a big plus (although I don't know why anyone would get a small drink when the price is the same for a large.) They have a few other items and even some deserts so McDonald's is a good choice even with the small selection. Taco Bell is another well known value menu. My only problem here is that all the items on their value menu are fairly small, therefore you would probably need 4-5 of an item to get filled up. A good choice for something to grab in the car when time is an issue. I've heard about KFC, Sonic, and Arby's also having value menu's, but have yet to try them out. Seems like Jack in the Box has a few items like the Breakfast Jack that is always a dollar. I think McDonald's and Wendy's are the top 2 choices personally. What are some of your value meal favorites? Is there a value menu we're missing out on? Let us know your opinions below. Q Up BBQ. The Greatest Food Truck Ever. The Dorito Locos Taco. Taco Bells McRib? !